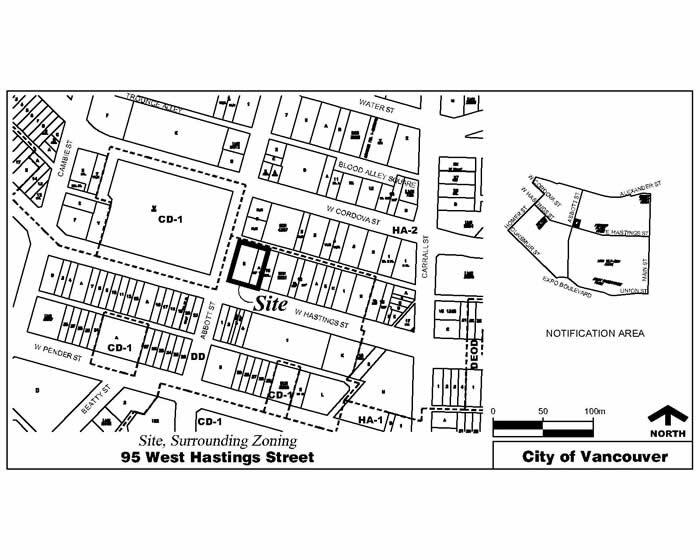 The City of Vancouver has received an application to rezone 95 West Hastings Street from DD (Downtown) District to CD-1 (Comprehensive Development) District. A community open house took place from 5 to 8 pm on Thursday, January 26, 2017 at Vancouver Community College, Room 240, with the applicant team and City staff available to answer questions. This application has been approved by Council at Public Hearing on March 13, 2018. To receive updates about the Downtown Eastside Plan, including information about rezoning applications, please visit vancouver.ca/dtes and provide your contact information in the box titled, “Get updates”.